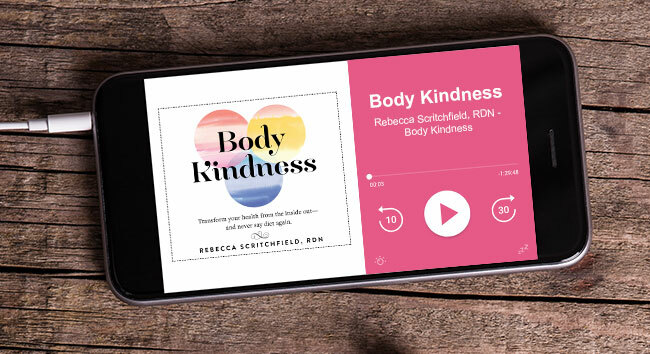 If you’re new to #BodyKindness our podcast mini-series, Learn and Grow, was made for you. We reflect on Bernie’s early days saying “bye-bye” to his relationship with The Biggest Loser and diet culture forever! In Part 4, you’ll hear us discuss emotional eating, feeling like you’re addicted to food, and why it’s probably NOT the case. Tune in to this pivotal episode if you’d like to learn how to get a better grasp on emotional eating. We discuss what’s wrong with labeling foods as “good” and “bad” and why you should fire the food police. I explain why all emotions, good and bad, are actually good for you. Bernie talked about his relationship with food since his time on The Biggest Loser, from feeling a responsibility to be a weight loss “ambassador”, to the challenges of everyday life and family food rituals. 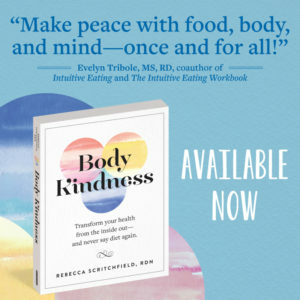 I shared how lack of self-compassion can be self-sabotaging when it comes to practicing body kindness and creating new healthy habits that last. 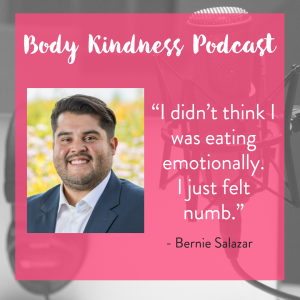 I gave Bernie practical and simple ideas for bringing more planning and body kindness into his day to help him practicing being the person he wants to become. Bernie and I discussed how unhelpful thoughts overpower the best intentions for changing – and how to handle them so they don’t run roughshod over you. We begin to touch on the idea of food addiction – is it real or is it just a habit? We tackled a great a question from a listener in Chicago, who wanted to know: how she can embrace intuitive eating if she doesn’t trust herself to make healthy choices? I share a story about a new client who struggles with perfectionism and how it gets in the way of her body kindness practice. And I invite listeners to share their challenges with emotional eating to address in a future show. In the news this week: A new study has found that negative messages about “bad” foods (e.g. “Red meat is bad for you!”) can trigger feelings of rebellion and make you want to eat those foods.